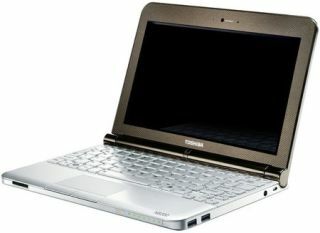 Toshiba announced today the successor to its NB100 netbook range. The NB200 has a bigger screen (up an inch from the NB100) and uses an N280 Atom Processor that boasts a clock speed of 1.66GHz.. This means there's plenty of power to run its Microsoft Windows XP Home Edition operating system. Unlike most netbooks on the market, the NB200 comes equipped with a near full size keyboard, so even the podgiest of fingers shouldn't have a problem typing away. Toshiba is also claiming a nine-hour battery life, but this is only if you upgrade. Normal battery is around the four-hour mark. The screen is a 10.1-inch widescreen TruBrite LED backlight display (1024x600) and when it comes to hard-disk space, you are looking at 160GB. Another interesting feature is the 3D-accelerometer monitoring system. Essentially, if you are the clumsy type, the netbook will assess any falls and protect the data on the hard drive prior to impact. Connecting to the web shouldn't be a problem, either, with Wi-Fi connectivity and Bluetooth thrown in for good measure. If your looking for 3G, then this is available as an upgrade option. There are also three USB ports ready for your accessories. The Mini NB200 will be available in May, with prices starting from £319.